New Liturgical Movement: Iconostasis, Rood Screen, Communion Rail...or Shag-Pile Carpeted Step? Iconostasis, Rood Screen, Communion Rail...or Shag-Pile Carpeted Step? The nature of the dividing line between sanctuary and nave in a church has been a hot topic over the years. I raise the subject today not to spill yet more ink in complaining about the removal of altar rails in churches over the last 50 years or so, although it is something I do feel strongly about. Rather, I am interested in trying to establish how, with due regard for tradition, we might encourage in the Roman Rite a renewed engagement with art in the liturgy, in the such a way that it deepens our participation, rather than distracts from it. One thing that always strikes me when I go to an Eastern Rite Catholic Church, (recently I have been attending St Elias Melkite Church in Los Gatos, California,) is how much more naturally priest, deacon, cantor and congregation engage with the icons during the liturgy. In contrast, in the Roman Rite, even in traditional congregations, apart from perhaps the crucifix and altarpiece, the choice of art seems to be governed more by the priest’s personal devotion than liturgical considerations, and there appears to be very little engagement with it during the liturgy itself. At best, sacred art provides a decorative backdrop that helps set an appropriate mood for the worship of God with direct engagement in the liturgy itself, which is largely a hands-clasped and eyes-closed activity. First a quick presentation of different options available to us. According to my research, the original division in both East and West was more like today’s altar rail, with gaps or doors for processing. 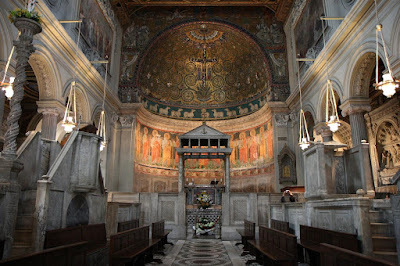 The typical “transenna” might have looked as this one at Sant’ Apollinarre in Ravenna, which I understand was restored in the 20th century. Another example from the 12th century, at San Clemente in Rome, which seems to follow the early traditional style. 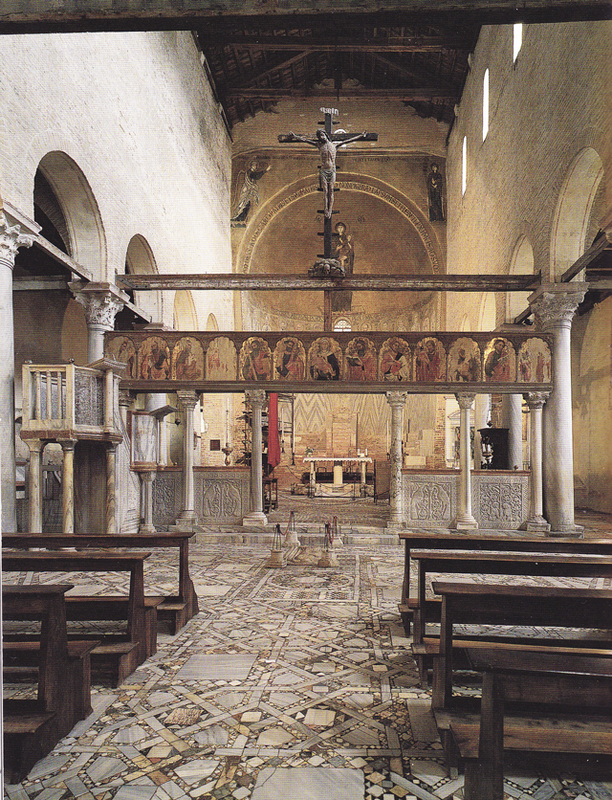 In time, from perhaps the 9th century onwards, the transenna grew upwards into a screen, as in this 9th century example from Santa Maria in Cosmedin in Rome. Gradually, we see images being added, as in the Byzantine-Venetian Torcello Cathedral, built in the 7th century, but restored in the 9th and 11th centuries. This then developed into the Western rood screen, “rood” being an old English word for the cross. 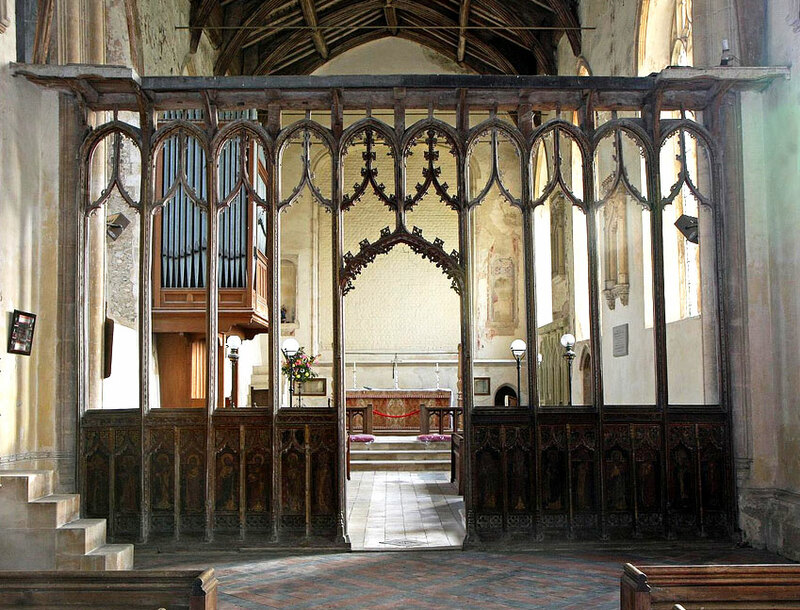 The example below is a 15th century screen from Cornwall in England. In the East, especially in Russia in the 15th century, we start to see the development of the solid iconostasis, the form that we tend to associate with Eastern churches today. 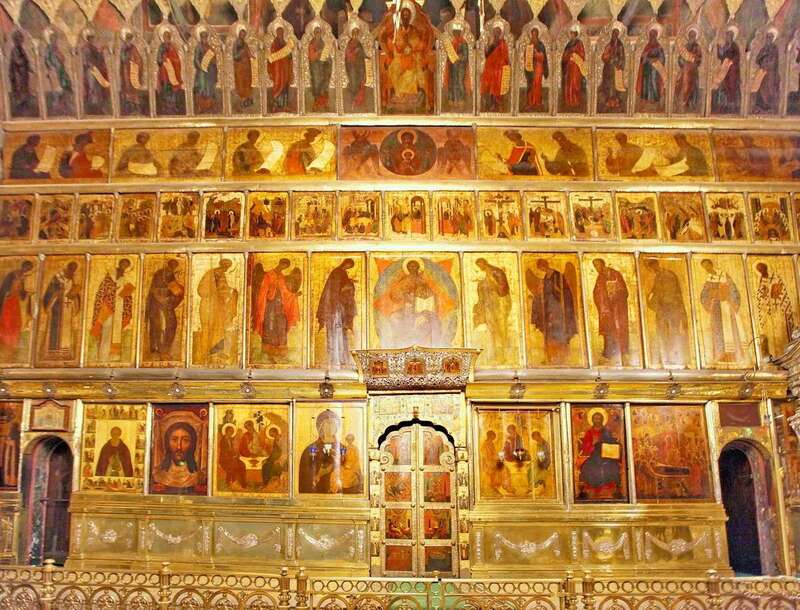 This is a 15th century Russian iconostasis. 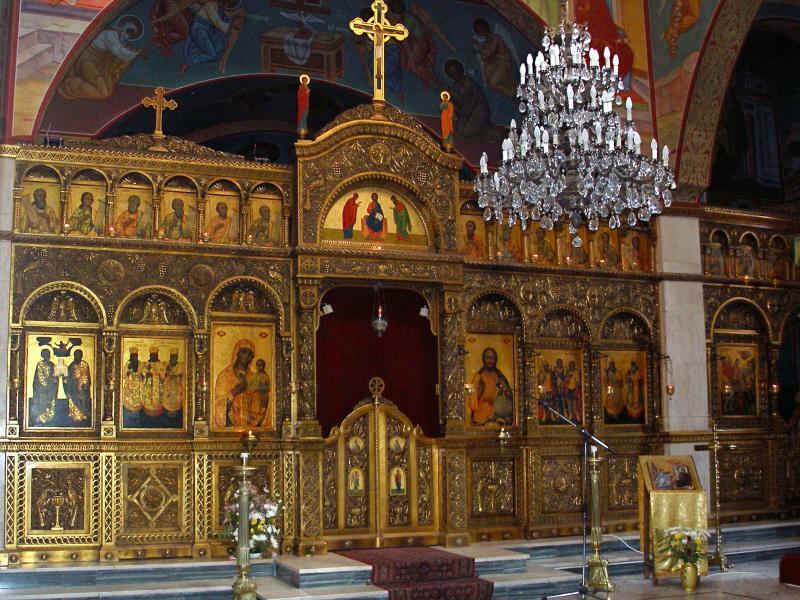 This is the iconostasis of the Melkite Greek-Catholic Cathedral in Jerusalem. Even in Eastern churches, icon screens are not always so high as to completely block the view of the apse. Here is a new icon screen from St Nicholas Russian Orthodox Church in Amsterdam. 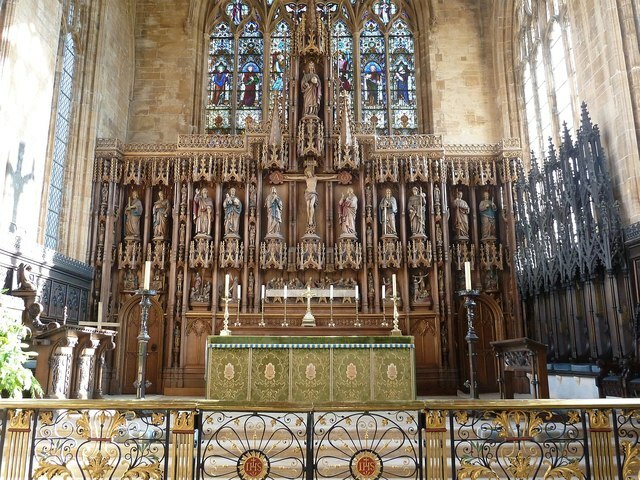 In the West, after the Council of Trent, in order to encourage greater connection between congregations and the sanctuary, many rood screens were removed, although they were never formally forbidden. The norm became the communion rail. 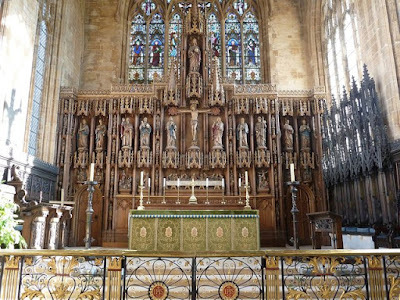 The multi-image altarpiece, the reredos, had developed in prominence - one might even think of it as an iconostasis behind the altar, even before the removal of rood screens. These can be painted or, as in the example above, sculpted. 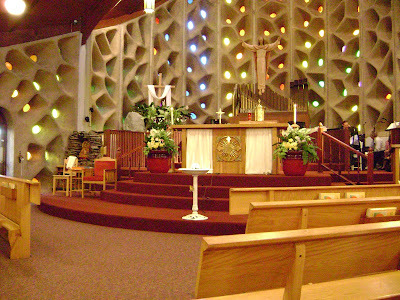 Then we have the more recent practice of removing even altar rails. Where do we go from here? Assuming due regard for tradition and good practice, what are the choices in regard to the encouragement of engagement with art? The images that work with the rail, screen and altar must be an integral part of the worship of God in the liturgy. 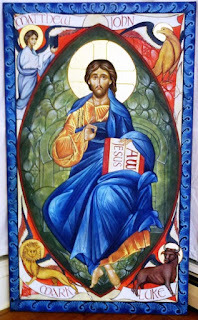 Their positioning, therefore, must be such that at critical moments in the liturgy, our attention is drawn to those images, which in turn direct our attention to the events taking place in a new light. They must be prominent enough that they are seen, but not so prominent that they distract. I would opt for communion rail with reredos, or a rood screen, in the Roman Rite, and encourage clergy to engage with images to show us the way, just as I have seen in the Eastern liturgies. In the Eastern liturgies, even when the altar is hidden by the iconostasis, we are aware of what is happening at key moments by audible chant; and the priest or deacon will emerge at specific times to pray before chosen icons and in so doing direct the attention of the congregation to it. Maybe this practice of showing us the important images in the course of the liturgy is something that we could do in the Roman Rite - perhaps it might bring deacons or servers into greater prominence in the Mass. Very obviously turning and looking at the image at key moments, censing images that relate to the feast or saint of the day or to the mysteries referred to at moments in the Mass, if done judiciously can, I suggest, increase personal engagement with the truth that the image is pointing us to. When I was working at Thomas More College of Liberal Arts, we gradually renovated an unusually shaped chapel (wider than it is long). We introduced the practice of taking communion on kneelers that were brought to the edge of the sanctuary space by the server during Mass. I painted the art in order to encourage this engagement. We did look into creating a raised rood screen, but architecturally it would have been too expensive, so instead we put a low hanging cross at the point where the screen would have been. The image of the cross was designed so that when in the eucharistic prayer the priest says the words, 'In humble prayer we ask you, almighty God: command that these gifts be borne by the hands of your holy Angel to your altar on high in the sight of your divine majesty,...' We can see the angel at the foot of the cross supporting Christ in sight of the Christ in Majesty behind. At the end of every Mass, we sang the St Michael Prayer and said angelus - the priest would face the image of St Michael and Our Lady when he did this, the servers and the congregation followed his lead. This photo was taken before the Christ in Majesty which is 6ft x 3ft was painted and erected in the middle, up high on the back wall. 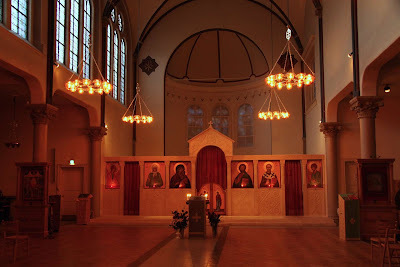 Similarly, the practice in Eastern Rite churches of putting a special icon for the day into prominence on a stand in front of the iconstasis could perhaps be introduced in some way in the Roman Rite, by putting the relevant image front and center in the nave, before altar rail or rood screen. All of these ideas are made on the further assumption that good judgment is exercised in considering the styles of art and in the canon of imagery on the reredos or rood screen. I have already written many times on the consideration of style, but in a future article will discuss possible principles that might be applied for the development of an appropriate canon of imagery for today.